Remember when we said that the Wii's Wiimote times out just like the Xbox 360's and the PS3's? Yeah, scratch one of those off the list. After leaving the SIXAXIS on the couch for a couple hours, we noticed the PS3's screensaver came on but the light on top of the controller was still active. When we picked up the controller, the screensaver turned off right away. 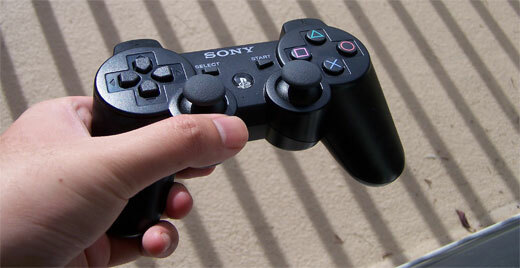 So unlike the 360 and Wii, the SIXAXIS does not conserve battery life by shutting off when not in use. In other news, the range on it is pretty good—probably similar to the 360's. I took it to the furthest corners of my apartment and I was still able to get reception/control the SIXAXIS.